Synopsis : From the author of the Sunday Times and New York Times bestseller The Expats, comes a riveting time-bomb of a thriller. In New York City, Isabel Reed, one of the most respected and powerful literary agents in the city, frantically turns the pages of a manuscript into the early dawn hours. This manuscript - printed out, hand-delivered, totally anonymous - is full of shocking revelations and disturbing truths, things which could compromise national security. Is this what she's been waiting for her entire career: a book that will help her move on from a painful past, a book that could save her beloved industry ...a book that will change the world? In Copenhagen, Hayden Gray, a veteran station chief, wary of the CIA's obsession with the Middle East, has been steadfastly monitoring the dangers that abound in Europe. Even if his bosses aren't paying attention, he's determined to stay vigilant. And he's also on the trail of this manuscript - and the secrets that lie at its heart. For him, quite simply, it must never see the light of day. As Isabel and Hayden try to outwit each other, the nameless author watches on from afar. With no-one quite sure who holds all the cards, the stakes couldn't be higher: in just twenty-four hours careers could be ruined, devastating secrets could be unearthed, and innocent people could die. 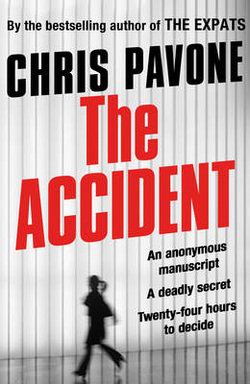 Gripping, sophisticated, and impossible to put down, The Accident is a masterful follow-up to one of the most acclaimed and striking debut thrillers of recent years.